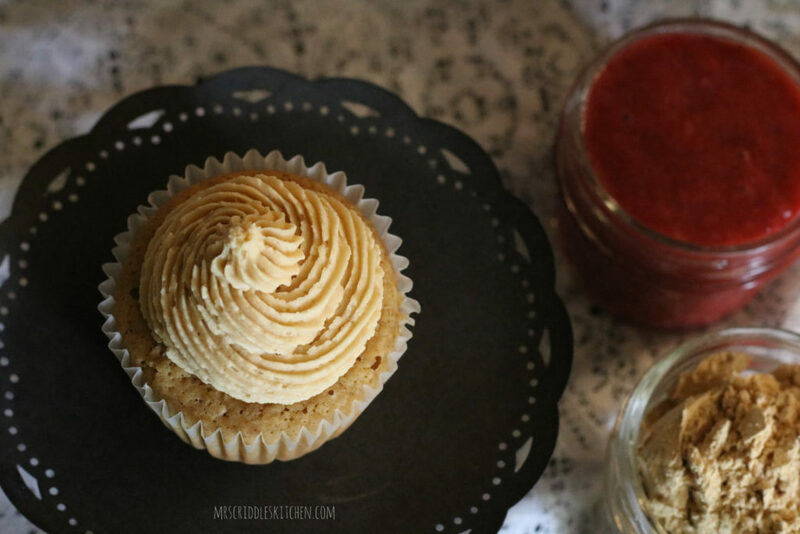 We love these Peanut Butter & Jelly Cupcakes! 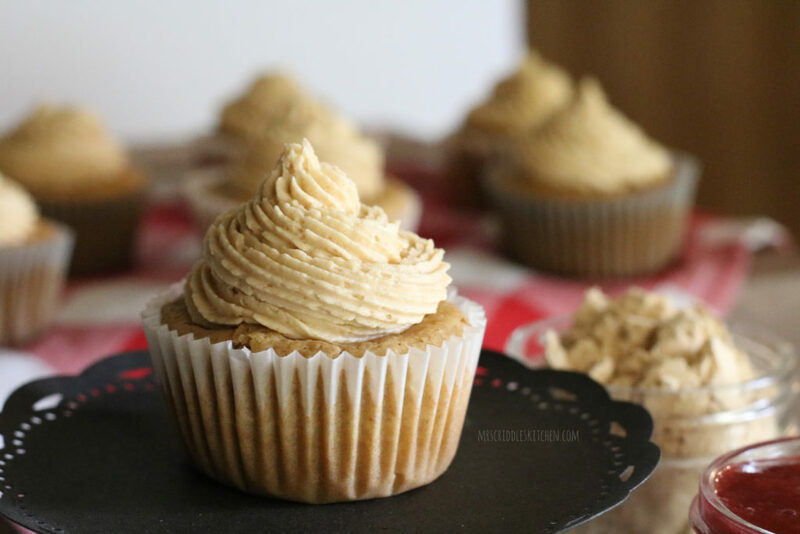 The peanut butter frosting is so yummy and the slightly tart strawberry jelly inside is the perfect touch! 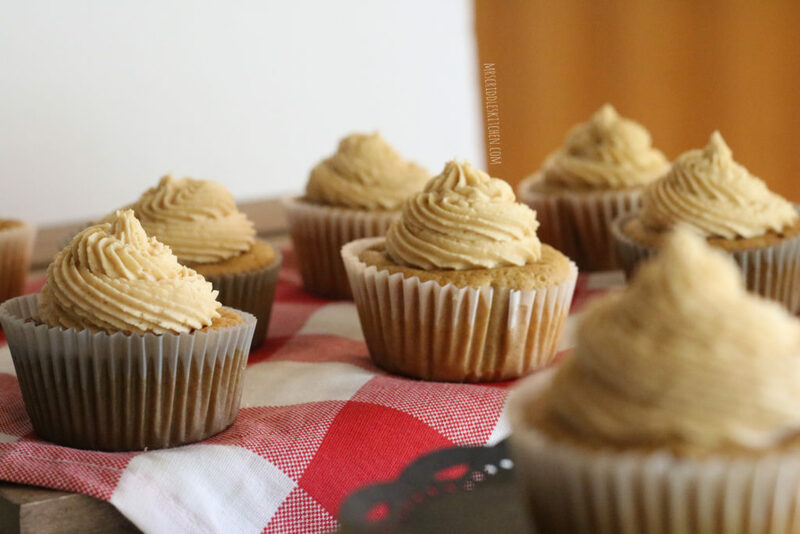 Abby used the THM Baking Blend on these again… to make them a little less heavy. Nut flour is so yummy but can be very calorie dense! We’ve actually made this jelly when we ran out of store bought jelly. My kids loved it and it kept well in our fridge. I would much rather have a sugar-free jelly that’s quick and easy to make than a store bought one full of sugar. Or even a store bought sugar free jelly that has bad sweeteners in it. These cupcakes really make great birthday cupcakes! My kids thought they were so good and could not get enough of the icing (my kids love icing)! Also, my husband loved them! These are a THM S for my Trim Healthy Mama friends… so that means they are low carb. The cake part of the cupcakes is dairy free. The frosting does have butter in it. Meet John Alan… named after both his grandpas and daddy. 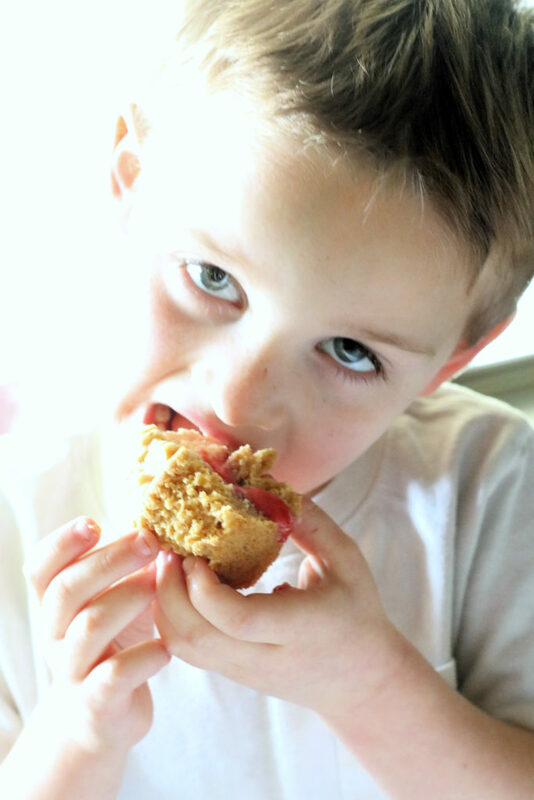 He loves the Peanut Butter & Jelly Cupcakes! 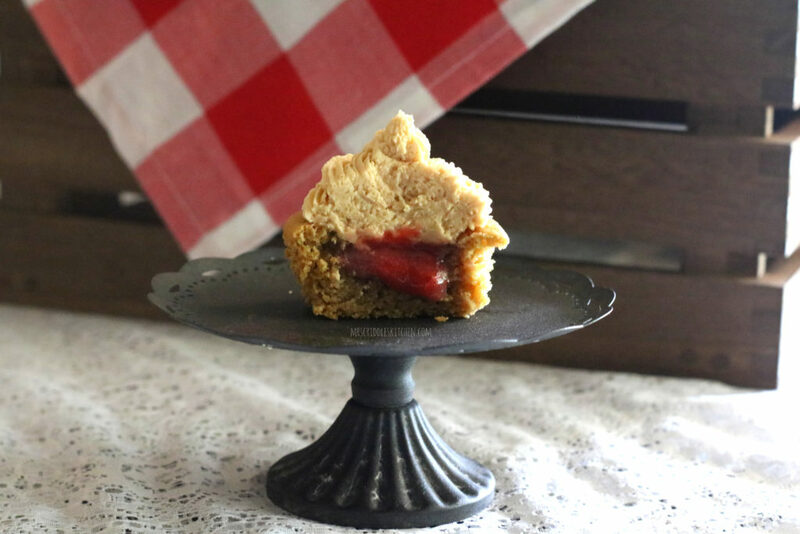 A peanut butter and jelly cupcake. 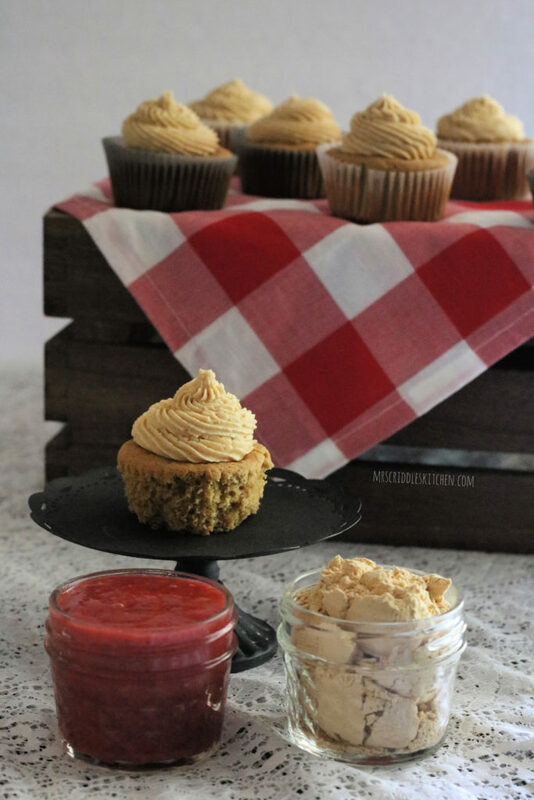 With a tart sweet strawberry jelly filling and a yummy peanut flour frosting! KIDS LOVE THIS! Combine dry ingredients in a bowl (Baking Blend, Peanut Flour, baking powder & soda, salt, and Gentle Sweet). Mix in the melted coconut oil. Heat up cashew milk till lukewarm in microwave (approx. 30 sec) or on stove top. Once warmed, add cashew milk to cupcake batter and begin mixing slowly, then turn speed up. Add in eggs and vanilla and mix thoroughly. Once mixed, begin scooping batter into cupcake liners and fill 2/3 of the way full (approx. 3 Tbs). Put in oven and bake for 23 minutes. While cup cakes bake, begin the strawberry jelly. Put water and strawberries into a sauce pan and cook down to a “mush”. Add Gentle Sweet and xanthum gum, mixing well over heat. Using a blender, food processor, or an emulsifier, blend mixture into a lump-free jelly. Allow to cool, and voila! Strawberry Jelly! Combine all ingredients into a bowl and start mixing slowly. Once ingredients start to bind together, turn the mixing speed up until completely mixed (this may take a minute or two). Remove cupcakes from oven and allow to cool completely. Once cupcakes have cooled, you can use a teaspoon or a piping tip to remove the insides of the cupcake and create a hole for the jelly. I used a Wilton tip 2A, stuck the end (the smaller end) into the cupcake and twisted. Scooping out the insides about 2/3 of the way into the cupcake. Fill all the cupcake holes to the top with strawberry jelly. 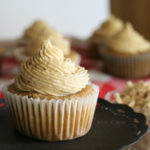 Using the piping tip of your choice (I used a Sunny SideUp Bakery tip 4B, but a Wilton tip 4B would work too) pipe your peanut butter buttercream in a swirl on top of the cupcake. There you have it! 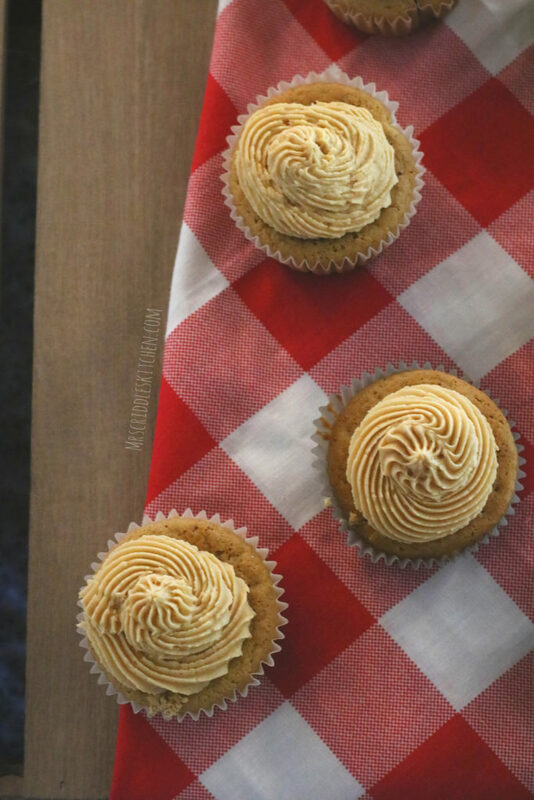 Peanut Butter and Jelly Cupcakes! !